Carousel Industries has signed an agreement with Tulsa, Oklahoma-based Oral Roberts University (ORU) to deliver seamless wireless connectivity across its entire 263-acre campus, which will enable the university to be linked to students around the world. The installation, which is already underway, features wireless equipment from Extreme Networks and will occur over multiple phases through mid 2016. 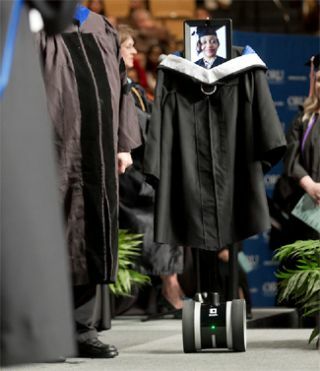 A distance learning student receives her diploma at Oral Roberts University via a telepresence robot, while being located more than 1,000 miles away. The infrastructure updates coincide with ORU's 50th anniversary, and will include more than $7 million in upgrades designed to impact academic growth and expansion. A major component of this expansion includes a Global Learning Center featuring three floors of smart classrooms, a multi-media production studio, a 715-seat performance hall and a virtual/augmented reality classroom capable of delivering more than 7,000 academic subjects in a live format. Creating this facility puts Oral Roberts University closer to achieving a completely digital society. "Carousel is delivering trailblazing distance learning technology to ORU as they celebrate their 50th anniversary," said James Marsh, chief revenue officer at Carousel Industries. "Working with visionary ORU staff who are dedicated to geographically inclusive education principles, we are committed to helping their vision of a digital society become a reality by leveraging our unparalleled expertise in wireless technology, managed services, and distance learning." According to Oral Roberts University's chief information officer Michael Mathews, the university hopes to extend the reach of education, regardless of location. "We already have 84 different nations represented at our University, and once this installation is complete, remote and prospective students will be able to experience the full breadth of our campus via telepresence robots," said Mathews. "The primary driver of this initiative is that if we can make education fluid, and if we have fluid technology, we can have successful student outcomes," Mathews continued. "We chose to work with Carousel because of its vast experience in multiple technology disciplines and project management expertise. My job is much easier when I can rely on a single, trusted advisor to oversee implementation of the entire wireless infrastructure." As the principal technology integrator responsible for overall design, integration and implementation, Carousel's initial focus will be on delivering seamless wi-fi to the university's chapel, which seats approximately 3,000 people and is the site of lectures, classes, and religious services. By delivering reliable wi-fi access to all points of the chapel, the ORU student body will be able to more efficiently access classroom programs and work portfolios and carry out tithing activities while online. Following installation of the chapel access points and antennas, other major areas of the campus will receive upgraded wi-fi — including the Global Learning Center — and when completed, will comprise approximately 900 access points. During Christmas break, Carousel will complete wi-fi installations and upgrades in the dorm rooms so once students return they will be able to experience a truly connected campus. The new wi-fi network being delivered by Carousel promises to help students make the most of distance learning experiences, as well. Since embarking on its ambitious digital society initiative and utilizing telepresence robots, ORU has already been able to facilitate campus tours, conduct student interviews, and even present a diploma onstage — with the student being located more than 1,000 miles away.